I have to admit just the last couple of weeks I haven't really been doing much beading. I've been filling up the well, as I like to say, instead. I find after doing heaps of creating, especially when I try to do as many of my own ideas as possible, I can run a little dry. So, I like to step back a bit, read some books, look at loads of things, do some bead shopping, think about possibilities and just let that creative moisture seep back into my life. I have two projects sitting on trays where I can see them every day. One is almost complete. All it needs is a little more beading added and a clasp. The other isn't really done, except for the beads and a rough shape of what it will become. The supplies for another piece, for a contest, arrived yesterday, so that will need to be laid out on a tray. I have another bracelet that just needs a clasp added and it's complete, too. Two of these pieces are gifts and two are for contests. So, there's going to be some furious beading happening, soon. It's ok, though. I'm confident I will get them done. I love the cycle of my creativity and have learnt to tune into it, submit myself to that ebb and flow. The tide is coming in and soon there will be loads of things happening. 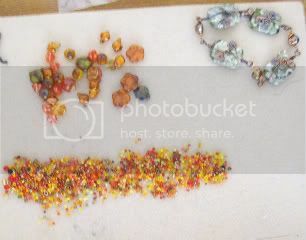 So, here's a photo of one project and the bracelet without the clasp. Not a fab photo, but it's just sitting here on the coffee table, so I didn't bother moving it.